BISMARCK, N.D. – As a result of the Salvation Army’s partnership with the SpartanNash Foundation and the six Dan’s Supermarkets in Bismarck and Mandan, the nonprofit organization’s food pantry recently received a $19,000 donation to help end hunger in the local community. The store directors from the six Dan’s Supermarkets presented the $19,000 check to Maj. John Flanagan during the Salvation Army’s 120th anniversary celebration and Red Kettle bell ringing campaign kickoff on Nov. 9. “We at the Salvation Army of Bismarck/Mandan North Dakota are amazed at the generous outpouring of support received from the SpartanNash Foundation, Dan’s Supermarkets and their guests with this donation of $19,000 to support our ongoing food pantry,” Flanagan said. “This tremendous support makes it possible for us to keep our pantry stocked so we can continue to help those in need of food in our community. 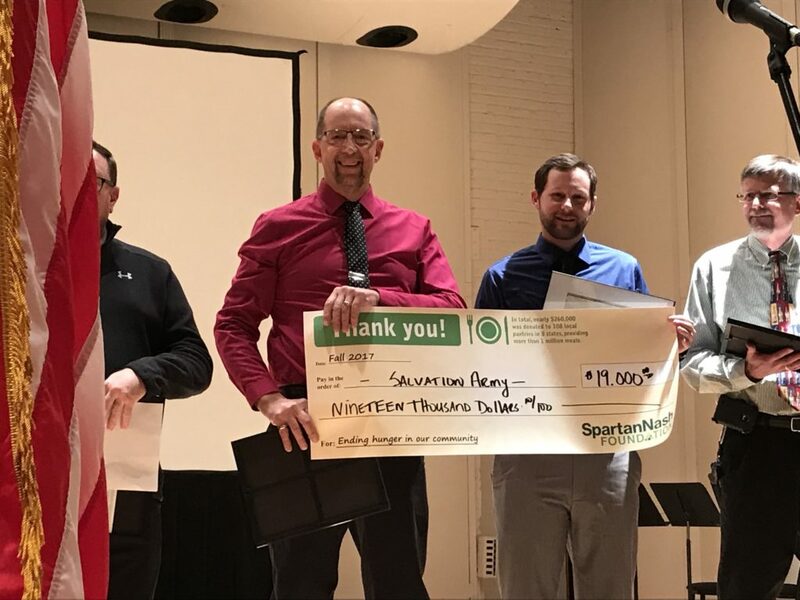 In total, the SpartanNash Foundation raised $260,000 to support more than 100 local food pantries and food banks in eight states during its companywide fundraising effort. Between Aug. 30 and Sept. 10, store guests who visited any participating SpartanNash-owned retail store or fuel center had the opportunity to donate $1, $5 or $10 at any checkout lane, with 100 percent of dollars raised going to support community food pantries and food banks such as the Salvation Army. SpartanNash – which owns the six Dan’s Supermarkets – underwrote the cost of the fundraising campaign so that all donations will benefit the Salvation Army and families in need in the local community. Each store personally selected the local community food partner its campaign would support, ensuring the scan to end hunger would have a significant local impact. In addition to monetary support through the SpartanNash Foundation, SpartanNash also donates distressed product to hundreds of community food pantries and local nonprofits. In 2016, SpartanNash donated 5.525 million pounds of distressed product through its corporate retail locations, distribution centers and MDV, the company’s military division based in Norfolk, Va.